A Guide to Moorcroft Marks and identifying dates for Moorcroft Pottery. The moorcroft pottery has mainly remained in the hands of one family since its creation and Moorcroft mark changes have been quite few. 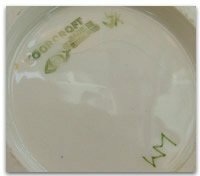 The main Moorcroft marks changed as William Moorcroft moved from Macintyre & Co, at the end of the 19th century and then when Walter Moorcroft took over from his father. The Moorcroft marks remained steady until the modern owners instigated a system of dating and then again until modern Moorcroft design studio artists, where allowed to mark the Moorcroft pottery they personally designed or created. 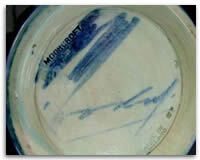 Modern Moorcroft marks continue to become more elaborate and to provide more and more information. 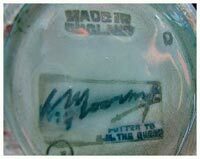 Moorcroft collectors should be aware of the Silver Stripe that sometimes appears and is almost always through the WM monogram. The Moorcroft silver stripe denotes a second quality or imperfect piece that has failed to pass the strict quality control that Moorcroft demands. These pieces are only ever sold at discounted prices in the Moorcroft factory shop. 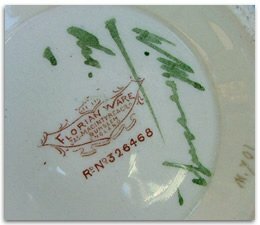 Typical early Florian ware mark in brown with handpainted William Moorcroft signature in green with ‘des’ below. Sometimes with pattern registration number. 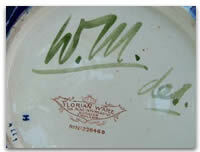 Typical early Florian ware mark in brown with handpainted W.M initials in green with ‘des’ below. 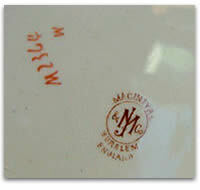 Common Macintyre & Co, Burslem brown printed mark. Can also be found in black. with rectangular paper label used for pricing by retailers. 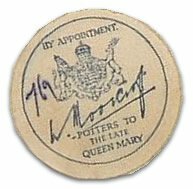 Impressed stamp mark used with facsimile signature and having ‘Potter to HM Queen’ at bottom right. 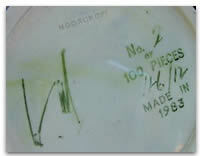 Used prior to and alongside the introduction of the paper label. 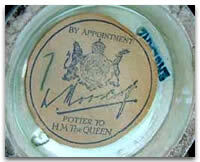 Early version of the Royal Warrant paper label – ‘Potter To HM The Queen’. The label was updated in 1936 to read ‘Potter To HM Queen Mary’, following the death of King George V.
Walter Moorcroft initial mark with MOORCROFT and MADE IN ENGLAND. it from his father Williams. 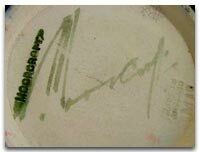 Walter Moorcroft full signature mark. one off pieces for exhibition or limited editions. Large impressed MOORCROFT with upper case MADE IN ENGLAND. Potters To The Late Queen Mary’. The Royal warrant expired in 1978 on the anniversary of Queen Mary’s death. Walter Moorcroft initial mark alongside impressed MOORCROFT on large limited edition Anemone vase. Possibly signed by a paintress as Walter did not sign every single piece. 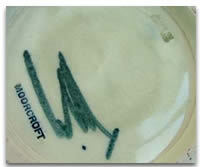 William John Moorcroft initial mark appears now ‘John Moorcroft’ is a director of the company and Walter a consultant. 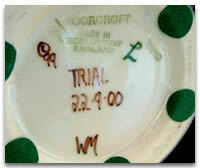 Modern Moorcroft mark depicting a trial piece. With upper case MOORCROFT and Stoke On Trent above ENGLAND. With trial date, copyright and WM in brown. Older trial pieces will not have as much information. 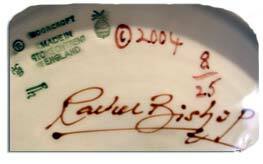 Modern Moorcroft mark for artist and designer Rachel Bishop.